The Book of Job (/dʒoʊb/; Hebrew: אִיוֹב Iyov) is a book in the Ketuvim ("Writings") section of the Hebrew Bible (Tanakh), and the first poetic book in the Old Testament of the Christian Bible. Addressing the problem of theodicy – the vindication of the justice of God in the light of humanity's suffering – it is a rich theological work setting out a variety of perspectives. It has been widely praised for its literary qualities, with Alfred Lord Tennyson calling it "the greatest poem of ancient and modern times". 5. Epilogue – Job's restoration (chapters 42:9–17). The prologue on Earth introduces Job as a righteous man, blessed with wealth, sons, and daughters. The scene shifts to Heaven, where God asks Satan (ha-satan, literally "the accuser") for his opinion of Job's piety. Satan answers that Job is pious only because God has blessed him; if God were to take away everything that Job had, then he would surely curse God. God gives Satan permission to take Job's wealth and kill all of his children and servants, but Job nonetheless praises God: "Naked I came out of my mother's womb, and naked shall I return: the Lord has given, and the Lord has taken away; blessed be the name of the Lord." God allows Satan to afflict his body with boils. Job sits in ashes, and his wife prompts him to "curse God, and die," but Job answers: "Shall we receive good from God and shall we not receive evil?" Job laments the day of his birth; he would like to die, but even that is denied to him. His three friends, Eliphaz the Temanite, Bildad the Shuhite and Zophar the Naamathite, console him. 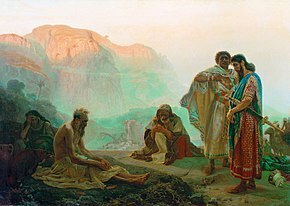 The friends do not waver in their belief that Job's suffering is a punishment for sin, for God causes no one to suffer innocently, and they advise him to repent and seek God's mercy. 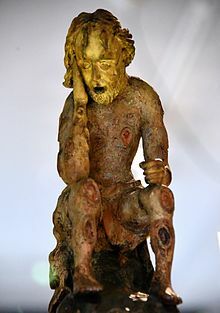 Job responds with scorn: his interlocutors are "miserable comforters" (Vulgate Latin: consolatores onerosi), since a just God would not treat him so harshly, patience in suffering is impossible, and the Creator should not take his creatures so lightly, to come against them with such force. Job's responses represent one of the most radical restatements of Israelite theology in the Hebrew Bible. He moves away from the pious attitude as shown in the prologue and began to berate God for the disproportionate wrath against him. He sees God as, among others, intrusive and suffocating (7:17-19); unforgiving and obsessed with destroying a human target (7:20-21); angry (9:13; 14:13; 16:9; 19:11); fixated on punishment (10:13-14); and hostile and destructive (16:11-14). He then shifts his focus from the injustice that he himself suffers to God's governance of the world. He suggests that the wicked have taken advantage of the needy and the helpless, who remain in significant hardship, but God does nothing to punish them (24:1-12). God speaks from a whirlwind. His speeches neither explain Job's suffering, nor defend divine justice, nor enter into the courtroom confrontation that Job has demanded, nor respond to his oath of innocence. Instead they contrast Job's weakness with divine wisdom and omnipotence: "Where were you when I laid the foundations of the earth?" Job makes a brief response, but God's monologue resumes, never addressing Job directly. In 42:1–6 Job makes his final response, confessing God's power and his own lack of knowledge "of things beyond me which I did not know". Previously he has only heard, but now his eyes have seen God, and "therefore I retract/ And repent in dust and ashes." 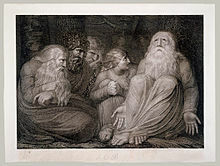 God tells Eliphaz that he and the two other friends "have not spoken of me what is right as my servant Job has done". The three (Elihu, the fourth friend introduced in chapter 32 is not mentioned here) are told to make a burnt offering with Job as their intercessor, "for only to him will I show favour". Job is restored to health, riches and family, and lives to see his children to the fourth generation. Job appears in the 6th-century BCE book of Ezekiel as a man of antiquity renowned for his righteousness, and the author of the Book of Job has apparently chosen this legendary hero for his parable. Rabbinic tradition ascribes it to Moses, but scholars generally agree that it was written between the 7th and 4th centuries BCE, with the 6th century BCE as the most likely period for various reasons. The anonymous author was almost certainly an Israelite, although he has set his story outside Israel, in southern Edom or northern Arabia, and makes allusion to places as far apart as Mesopotamia and Egypt. The language of Job stands out for its conservative spelling and for its exceptionally large number of words and forms not found elsewhere in the Bible. The 12th century Jewish scholar Ibn Ezra concluded that the book must have been written in some other language and translated into Hebrew, and many later scholars down to the 20th century looked for an Aramaic, Arabic or Edomite original, but a close analysis suggests that the foreign words and foreign-looking forms are literary affectations designed to lend authenticity to the book's distant setting. Job exists in a number of forms: the Hebrew Masoretic Text, which underlies many modern Bible translations; the Greek Septuagint made in Egypt in the last centuries BCE; and Aramaic and Hebrew manuscripts found among the Dead Sea Scrolls. Job, Ecclesiastes and the Book of Proverbs belong to the genre of wisdom literature, sharing a perspective that they themselves call the "way of wisdom". Wisdom means both a way of thinking and a body of knowledge gained through such thinking, as well as the ability to apply it to life. It is attainable in part through human effort and in part as a gift from God, but never in its entirety – except by God. The three books share attitudes and assumptions but differ in their conclusions: Proverbs makes confident statements about the world and its workings that are flatly contradicted by Job and Ecclesiastes. Wisdom literature from Sumeria and Babylonia can be dated to the second millennium BCE. Several texts from ancient Mesopotamia and Egypt offer parallels to Job, and while it is impossible to tell whether the author of Job was influenced by any of them, their existence suggests that he was the recipient of a long tradition of reflection on the existence of inexplicable suffering. Job is an investigation of the problem of divine justice. This problem, known in theology as theodicy, can be rephrased as a question: "Why do the righteous suffer?" The conventional answer in ancient Israel was that God rewards virtue and punishes sin (the principle known as "retributive justice"). This assumes a world in which human choices and actions are morally significant, but experience demonstrates that suffering is frequently unmerited. The biblical concept of righteousness was rooted in the covenant-making God who had ordered creation for communal well-being, and the righteous were those who invested in the community, showing special concern for the poor and needy (see Job's description of his life in chapter 31). Their antithesis were the wicked, who were selfish and greedy. The Satan (or The Adversary) raises the question of whether there is such a thing as disinterested righteousness: if God rewards righteousness with prosperity, will men not act righteously from selfish motives? He asks God to test this by removing the prosperity of Job, the most righteous of all God's servants. The book begins with the frame narrative, giving the reader an omniscient "God's eye perspective" which introduces Job as a man of exemplary faith and piety, "blameless and upright", who "fears God" and "shuns evil". 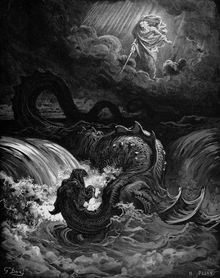 The contrast between the frame and the poetic dialogues and monologues, in which Job never learns of the opening scenes in heaven or of the reason for his suffering, creates a sense of dramatic irony between the divine view of the Adversary's wager, and the human view of Job's suffering "without any reason" (2:3). Chapter 28, the Hymn to Wisdom, introduces another theme, divine wisdom. The hymn does not place any emphasis on retributive justice, stressing instead the inaccessibility of wisdom. Wisdom cannot be invented or purchased, it says; God alone knows the meaning of the world, and he grants it only to those who live in reverence before him. God possesses wisdom because he grasps the complexities of the world (28:24–26) – a theme which looks forward to God's speech in chapters 38–41 with its repeated refrain "Where were you when...?" In the Second Temple period (500 BCE – 70 CE) Job began being transformed into something more patient and steadfast, with his suffering a test of virtue and a vindication of righteousness for the glory of God. 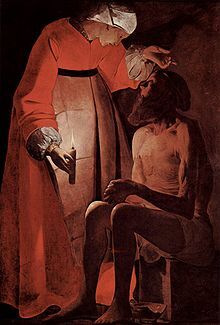 The process of "sanctifying" Job began with the Greek Septuagint translation (c. 200 BCE) and was furthered in the Testament of Job (1st century BCE – 1st century CE), which makes him the hero of patience. This reading pays little attention to the Job of the dialogue sections of the book, but it was the tradition taken up by the Epistle of James in the New Testament, which presents Job as one whose patience and endurance should be emulated by believers (James 5:7–11). When Christianity began interpreting Job 19:23–29 (verses concerning a "redeemer" whom Job hopes can save him from God) as a prophecy of Christ, the predominant Jewish view became "Job the blasphemer", with some rabbis even saying that he was rightly punished by God because he had stood by while Pharaoh massacred the innocent Jewish infants. Augustine of Hippo recorded that Job had prophesied the coming of Christ, and Gregory the Great offered him as a model of right living worthy of respect. The medieval Jewish scholar Maimonides declared his story a parable, and the medieval Christian Thomas Aquinas wrote a detailed commentary declaring it true history. In the Reformation Martin Luther explained how Job's confession of sinfulness and worthlessness underlay his saintliness, and John Calvin's Job demonstrated the doctrine of the resurrection and the ultimate certainty of divine justice. The contemporary movement known as creation theology, an ecological theology valuing the needs of all creation, interprets God's speeches in Job 38–41 to imply that his interests and actions are not exclusively focused on humankind. Job (Arabic Ayyub ايوب) is one of the 25 prophets mentioned by name in the Quran, where he is lauded as a steadfast and upright worshiper (Q.38:44). His story has the same basic outline as in the Bible, although the three friends are replaced by his brothers, and his wife stays by his side. In Palestinian folklore Job's place of trial is Al-Joura, a village outside the town of Al Majdal (Ashkelon). It was there that God rewarded him with a Fountain of Youth that removed whatever illnesses he had and restored his youth. Al-Joura was a place of annual festivities (four days in all) when people of many faiths gathered and bathed in a natural spring. In Lebanon the Muwahideen (or Druze) community have a shrine built in the Shouf area that allegedly contains Job's tomb. In Turkey, Job is known as Eyüp, and he is supposed to have lived in Şanlıurfa. There is also a tomb of Job outside the city of Salalah in Oman. ^ Hartley 1988, p. 3. ^ a b Lawson 2005, p. 11. ^ Seow 2013, p. 87. ^ Seow 2013, p. 74. ^ Bullock 2007, p. 87. ^ Walton 2008, p. 343. ^ a b Walton 2008, p. 333. ^ Kugler & Hartin 2009, p. 191. ^ Kugler & Hartin 2009, p. 190. ^ Clines, David J.A. (2004). "Job's God". Concilium. 2004 (4): 39-51. ^ a b Seow 2013, pp. 33–34. ^ Sawyer 2013, p. 27. ^ Walton 2008, p. 339. ^ Sawyer 2013, p. 28. ^ Habel 1985, p. 575. ^ Kugler & Hartin 2009, p. 33. ^ Fokkelman 2012, p. 20. ^ Kugler & Hartin 2009, p. 193. ^ Seow 2013, p. 44. ^ Seow 2013, p. 17. ^ Seow 2013, pp. 21–24. ^ Seow 2013, pp. 1–16. ^ Farmer 1998, p. 129. ^ Farmer 1998, pp. 129–30. ^ Farmer 1998, pp. 130–31. ^ Bullock 2007, p. 84. ^ Hartley 2008, p. 346. ^ Hartley 2008, p. 360. ^ Bullock 2007, p. 82. ^ Hooks 2006, p. 58. ^ Brueggemann 2002, p. 201. ^ Brueggemann 2002, pp. 177–78. ^ Walton 2008, pp. 336–37. ^ Hooks 2006, p. 57. ^ a b O'Dowd 2008, pp. 242–43. ^ a b Seow 2013, pp. 97–98. ^ Kugler & Hartin 2009, p. 194. ^ Dell 2003, p. 356. ^ Hooks 2006, pp. 329–30. ^ Fiddes 1996, p. 174. ^ Walton 2008, p. 338. ^ Sawyer 2013, p. 34. ^ Barton 2008, pp. 338–39. ^ Seow 2013, p. 111. ^ Allen 2008, pp. 362–63. ^ Dell 1991, pp. 6–7. ^ Allen 2008, p. 362. ^ Simonetti, Conti & Oden 2006, pp. 105–06. ^ Allen 2008, pp. 361–62. ^ a b Noegel & Wheeler 2010, p. 171. ^ Allen 2008, pp. 368–71. ^ Farmer 1998, p. 150. ^ Wheeler 2002, p. 8. Allen, J. (2008). "Job III: History of Interpretation". In Longman, Tremper; Enns, Peter (eds.). Dictionary of the Old Testament: Wisdom, Poetry & Writings. InterVarsity Press. ISBN 9780830817832. Dell, Katharine J. (2003). "Job". In Dunn, James D. G.; Rogerson, John William (eds.). Eerdmans Bible Commentary. Eerdmans. ISBN 9780802837110. Farmer, Kathleen A. (1998). "The Wisdom Books". In McKenzie,, Steven L.; Graham, Matt Patrick (eds.). The Hebrew Bible Today: An Introduction to Critical Issues. Westminster John Knox Press. ISBN 9780664256524. Fiddes, Paul (1996). "'Where Shall Wisdom be Found?' Job 28 as a Riddle for Ancient and Modern Readers". In Barton, John; Reimer, David (eds.). After the Exile: Essays in Honour of Rex Mason. Mercer University Press. ISBN 9780865545243. Fokkelman, J.P. (2012). The Book of Job in Form: A Literary Translation with Commentary. BRILL. ISBN 978-9-0042-3158-0. Hartley, John E. (1988). The Book of Job. Eerdmans. ISBN 978-0-8028-2528-5. Hartley, John E. (2008). "Job II: Ancient Near Eastern Background". In Longman, Tremper; Enns, Peter (eds.). Dictionary of the Old Testament: Wisdom, Poetry & Writings. InterVarsity Press. ISBN 978-0-8308-1783-2. Habel, Norman C (1985). The Book of Job: A Commentary. Westminster John Knox Press. ISBN 978-0-6642-2218-5. Hooks, Stephen M. (2006). Job. College Press. ISBN 978-0-8990-0886-8. Kugler, Robert; Hartin, Patrick J. (2009). An Introduction to the Bible. Eerdmans. ISBN 978-0-8028-4636-5. Lawson, Steven J. (2005). Job. B&H Publishing Group. ISBN 978-0-8054-9470-9. Murphy, Roland Edmund (2002). The Tree of Life: An Exploration of Biblical Wisdom Literature. Eerdmans. ISBN 978-0-8028-3965-7. Noegel, Scott B.; Wheeler, Brannon M. (2010). The A to Z of Prophets in Islam and Judaism. Scarecrow Press. ISBN 978-1-4617-1895-6. O'Dowd, R. (2008). "FrameNarrative". In Longman, Tremper; Enns, Peter (eds.). Dictionary of the Old Testament: Wisdom, Poetry & Writings. InterVarsity Press. ISBN 978-0-8308-1783-2. Pihlström, Sami (2015). "Chapter 5. The Problem of Evil and Pragmatic Recognition (pp. 77—101)". In Skowroński, Krzysztof Piotr (ed.). Practicing Philosophy as Experiencing Life. Essays on American Pragmatism. Leiden: BRILL. doi:10.1163/9789004301993_006. ISBN 978-9-0043-0199-3. Docx. Sawyer, John F.A. (2013). "Job". In Lieb, Michael; Mason, Emma; Roberts, Jonathan (eds.). The Oxford Handbook of the Reception History of the Bible. Oxford University Press. ISBN 978-0-1992-0454-0. Seow, C.L. (2013). Job 1–21: Interpretation and Commentary. Eerdmans. ISBN 978-0-8028-4895-6. Walton, J.H. (2008). "Job I: Book of". In Longman, Tremper; Enns, Peter (eds.). Dictionary of the Old Testament: Wisdom, Poetry & Writings. InterVarsity Press. Wollaston, Isabell (2013). "Post-Holocaust Interpretations of Job". In Lieb, Michael; Mason, Emma; Roberts, Jonathan (eds.). The Oxford Handbook of the Reception History of the Bible. Oxford University Press.